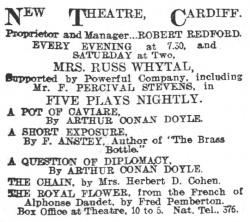 A Question of Diplomacy is a British 1-act play performed by Arthur Hardy's company in various Theatres in UK between 5 september and 21 october 1910. This is an adaptation of the Arthur Conan Doyle's short story A Question of Diplomacy (1892). 17-21 october 1910 : The Kennington, S.E. This page was last edited on 13 January 2018, at 19:51.